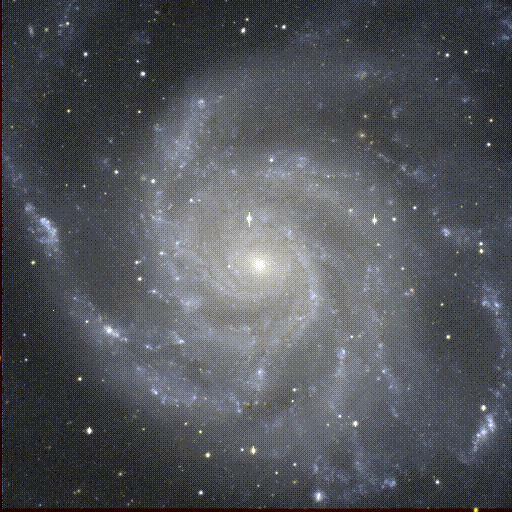 This image shows the Pinwheel Galaxy M101. It was taken by Peter Bunclark in 1998. The picture was produced by composing three, two-minute, exposures taken through R, V and B Harris photometric filters, approximating the normal red, green and blue passbands. 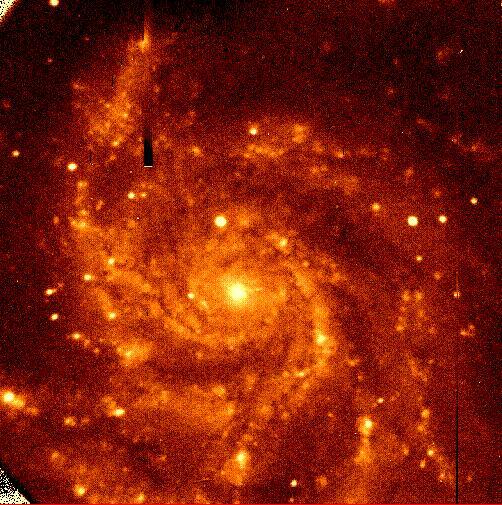 The area shown is approximately 30x30 arc minutes, ie the full field of the Wide-Field Camera CCD mosaic at the prime-focus of the Isaac Newton Telescope. 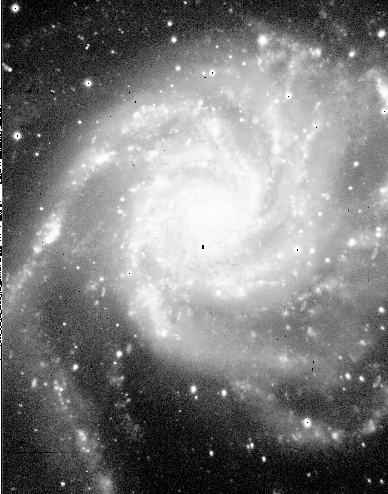 This is the nearby Sc spiral (in fact, perhaps the textbook example of a luminous so-called luminosity class I spiral) NGC 5457 or Messier 101. It has several extremely luminous star-forming (H II) regions in the outer spiral arms, some sporting their own NGC numbers. It dominates a small group of galaxies, with some of its neighbors such as NGC 5474 showing wear and tear attributed to the tidal effects of M101. 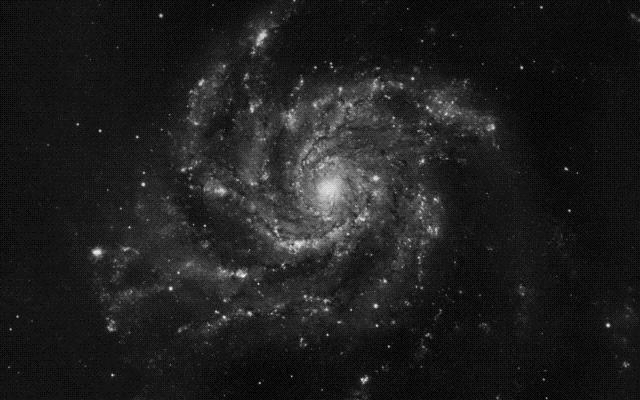 M101 itself is further noteworthy for its extensive and lopsided distribution of neutral hydrogen gas, and for showing evidence of gas falling into its disk at high speeds. This is a color CCD image. 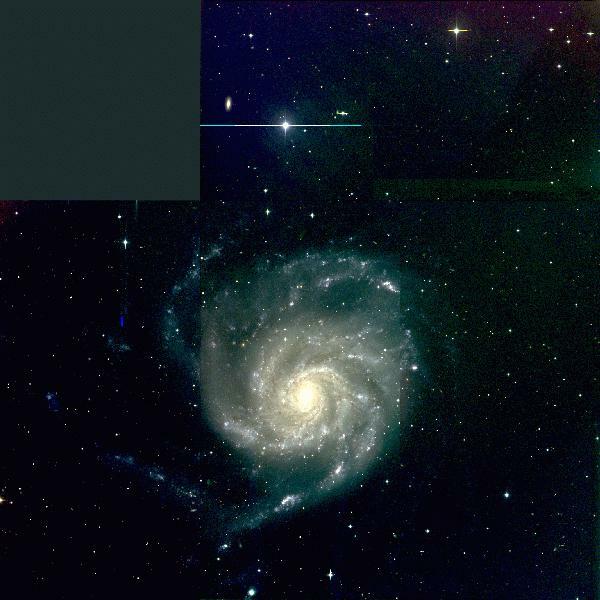 Older, blue-light exposure of M101, taken by Bill Keel with a focal reducer on the 1.1-meter Hall telescope of Lowell Observatory.